Enjoy peace and quiet with ocean views during your North Myrtle Beach vacation at Sea Farer, a North Myrtle Beach resort that is located on the oceanfront. Sea Farer is found in the Windy Hill section of North Myrtle Beach, South Carolina. This oceanfront North Myrtle Beach resort is only three stories tall so it is of a more nostalgic size. Relaxation in this mid-size North Myrtle Beach resort comes quite easily as life is just a little quieter here at Sea Farer. This North Myrtle Beach resort boasts an oceanfront swimming pool that features a sandy path that leads straight to the white sandy beaches. Lounge chairs and picnic tables surround the sparkling blue swimming pool so you can hang out poolside for the whole afternoon and be quite comfortable during your North Myrtle Beach vacation. Sea Farer is a North Myrtle Beach resort that offers guests two-bedroom North Myrtle Beach condominium rentals. Each of these North Myrtle Beach vacation rentals has a balcony with ocean views. 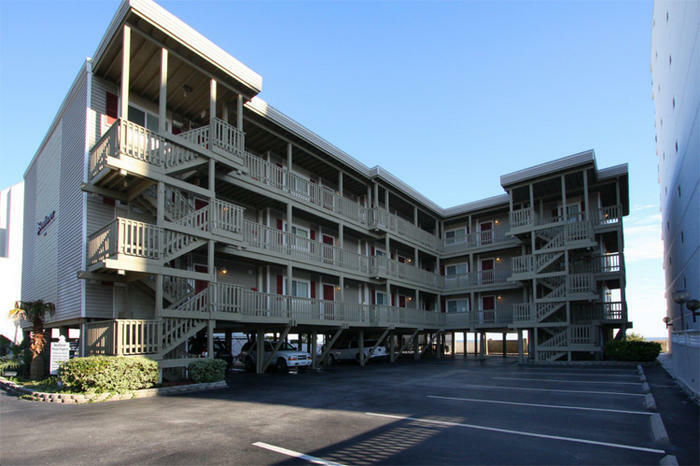 There are also two full baths in each of these condos in North Myrtle Beach, South Carolina. Up to six people are nicely accommodated in these two-bedroom North Myrtle Beach rentals at Sea Farer. Each of the North Myrtle Beach vacation rentals at Sea Farer are uniquely decorated and furnished, though the amenities are often the same, so choose the one that best suits the needs of your family. These North Myrtle Beach condo rentals have a kitchen that comes furnished with dishes, pots and pans and more. There are small appliances like a coffee maker and full-size appliances like a dishwasher, refrigerator and stove that help make your North Myrtle Beach vacation one that is brimming with conveniences. The Sea Farer North Myrtle Beach vacation rentals also have high-speed Internet access. Bring your laptop computer and get online during your North Myrtle Beach vacation. It is handy having Internet access in these North Myrtle Beach rentals because you can check tee times for the many golf courses, look at restaurant menus before you make reservations and reserve tickets for the best shows at the best live entertainment theatres in town. For your use there is also at least one DVD player in these condos in North Myrtle Beach, South Carolina. Have a quiet movie night with the kids during your North Myrtle Beach vacation at Sea Farer. Sometimes after a long day on the beach or a busy day of shopping you just want to sit and relax. Watching your favorite movies while at the beach is a good way to take it easy. Elliott Beach Rentals is not affiliated with onsite management or the HOA of Sea Farer.